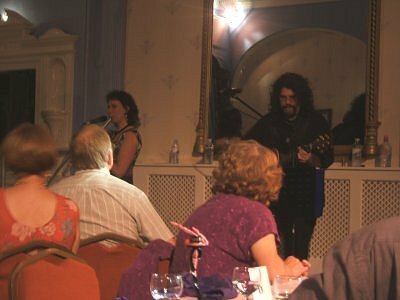 Here is my review of the fantastic acoustic concert featuring Phil Bates with his wife Jo and daughter Rosie, along with Tina McBain and Martin Kelly at Tamworth's beautiful Castle Hotel. What a hectic week this had been, with myself, Sue & the kids having spent the previous weekend up at Edinburgh in Scotland watching the superb gig by The Orchestra at the Playhouse Theatre. What a superb concert it was too (as can be read about in my review). As it later transpired there were to be a few 'coincidences' this particular week, as having been to watch the Orchestra guys, we heard of the sad news that Hux's father had 'passed away' the previous day. Hux thus had to travel back to the States for the funeral preparations, leaving the band in a bit of a predicament as there were still another four gigs left of the U.K. tour. But who should come to the 'rescue' but former ELO Part II member, and actually the guy that Hux 'replaced' back in 1999, Phil Bates. Phil took to the stage in Truro and Cardiff before Hux returned for the last 2 gigs of the tour. One of my original 'concerns' was whether the Tamworth gig would be going ahead as this coincided with the last night of The Orchestra's U.K. tour, but I need not have worried as Hux had returned for those last 2 gigs. As a further explanation into the time it has taken to post this particular review is that a few days after returning from the Tamworth gig, Sue's father sadly 'passed away' very suddenly and unexpectedly and it has taken some time for us all to come to terms with. Anyhow, back to the gig review!!!!!!! 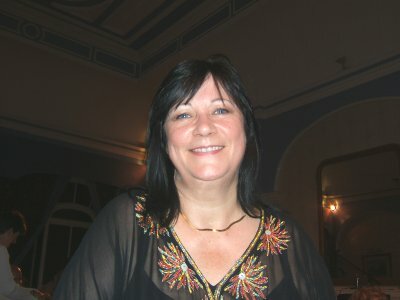 Myself and Sue travelled down to Tamworth earlier on the day of the gig as we were staying overnight at the Castle Hotel (it is over 200 miles from Carlisle down to Tamworth). We therefore got checked into the hotel and had time for a stroll around the town centre on what was a very warm day, probably into the 90's. We returned to the hotel to get changed and down to the bar for a couple of drinks prior to the gig. We had a nice chat with a few of the locals along with Tina McBain and the promotor Ian Gibbons. This particular gig being part of the regular 'Candlelit Cabaret' evenings held at the hotel which prior to the concert feature a 4 course meal (which was absolutely gorgeous) in a lovely setting, very relaxed with between 70 to 100 people, and the entertainment begins shortly after the meal is finished. Firstly local artist Martin Kelly performed some great solo tracks on the guitar, followed by Tina McBain (who was in The Eleanor Rigby Experience with Phil Bates and has performed regularly with Phil for many years). She has an exquisite voice and received loud appreciative applause afterwards. After a short break, Phil Bates took to the stage where he performed a number of his own solo songs, some classic tracks and also a few Electric Light Orchestra songs including 'Evil Woman' and 'Can't Get It Out Of My Head'. Between songs he chatted to the audience and mentioned how this was to have been a nice quiet week leading up to tonights gig. However after receiving a phone call the previous weekend, he hurriedly agreed to stand in for Hux at The Orchestra's concerts in Truro and Cardiff. Phil was soon joined on stage by his wife Jo where they performed a few songs, before being joined by his eldest daughter Rosie for what was to be her live debut!! And what a debut!! For somebody so young on her first live stage performance she showed no signs of nerves and sang superbly alongside Phil and Jo plus she sang a couple of solo songs including Avril Lavigne's hit track, plus 'World Without Pain' and 'Knocking On Heavens Door'. Tina McBain took to the stage with Phil, Jo & Rosie for a few songs and rounding off the evening with a brilliant rendition of 'Blackberry Way' which had the whole audience joining in. I can highly recommend the Candlelit Cabaret evenings at The Castle Hotel, and I wish Ian & Tina all the best with this venture. 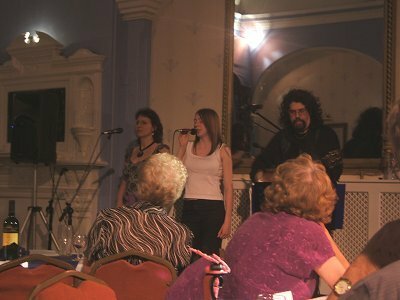 Phil Bates and Tina McBain return to the Castle Hotel for the annual Twixtmas Special on December 27th & 28th (hope to be there)! !